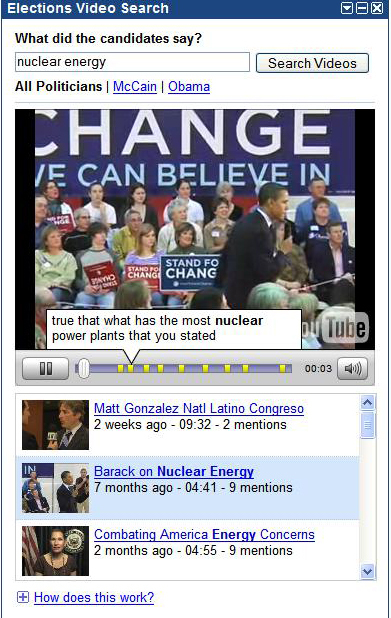 Google released a new tool today to help voters scour through the thousands of hours of political footage on YouTube. The feature is called the Elections Video Search. A user can type in a phrase and then see what candidates across the nation have said about that specific issue. The screen shot below shows the results returned for a search on "nuclear energy." When you play an individual video, yellow marks on the timeline delineate where the topic is mentioned in the speech. By mousing over one of those marks, you can read the direct quote. It's a pretty neat technology and will be really helpful to voters wanting to learn where candidates stand on specific issues. Currently, it seems that the tool is aimed mainly at the Presidential candidates - it actually allows you to filter the results to show just McCain or Obama quotes. This is just another example of a free tool to help support your online campaign strategy. Looking forward to watching how it continues to develop, scale, and be used.